Chichester Folk Song Club is exactly what it says on the tin: a centre of folk music, for over fifty years, in the fine city of Chichester. 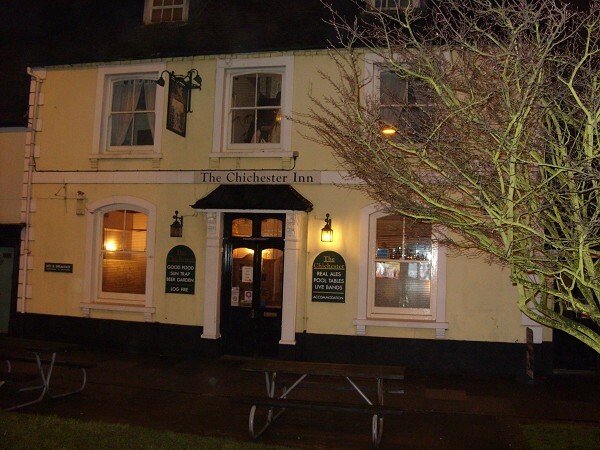 The club meets every week of the year at the excellent venue of The Chichester Inn. The present format is that of a singaround club, with everyone having the opportunity to perform a song or tune. Irregularly (about once a month) we host a guest evening, when national/international artistes from the wider world of folk music provide the main entertainment within the singaround. As we are a singaround club we do not generally offer floor-spots. To maintain variety we have a number of MC's running the proceedings throughout the year. So every night is going to be different as each MC brings their own touch to the evening's performance, be it Guest Night, theme night or singaround. The evening starts at 8.15, but there is an informal tunes session from 7.45 onwards. Contact us (email or phone) and we can advise how early to get to club. No tickets or admission charges but we do take a collection. For Singaround nights we expect £2 per head. On Guest nights it is £5 (members £2). For those thinking that our amazingly low prices mean a cut-price act, please bear in mind that our regular members will be paying £10-12 for each guest night, and that the each guest gets their contractual fee irrespective of audience attendance on the night. We do not charge high prices just to make the artist look good, we let their talent do that for them. and various social invites such as the Christmas party, Picnic and annual Piggy Dinner. An unsolicited testimonial:"I thought I would drop you a line and say thank you for a great evening! Lucy (Lucy Ward 2/10/2) was talented, entertaining and funny as ever! However I was really impressed with the talents and the enthusiasm of your members. There are some great singing, musicianship and interaction throughout the evening...."
The Chichester Inn is now our new home. It is ideally suited to our requirements as it is an established music venue with a great dedicated function room with good acoustics, space, furniture and beer. It also does food and has B&B rooms so, if you are coming a bit of a distance for one of our guest nights you could even stay over! It has a great garden space and parking, plus there is a big public car-park just over the road. Check out their excellent website for more details, or, even better, pop in during your next visit to Chi' and check out our new home for youself.